A jar of my gardeners hand balm has become a staple in my house. I have a jar in the kitchen and on my bedside table. Similar to a salve, a balm is a fragrant ointment or preparation used to heal or soothe the skin. This gardeners hand balm is a traditional balm; it is firm in the jar and will melt into the skin as you rub it in (salves are usually softer in consistency). 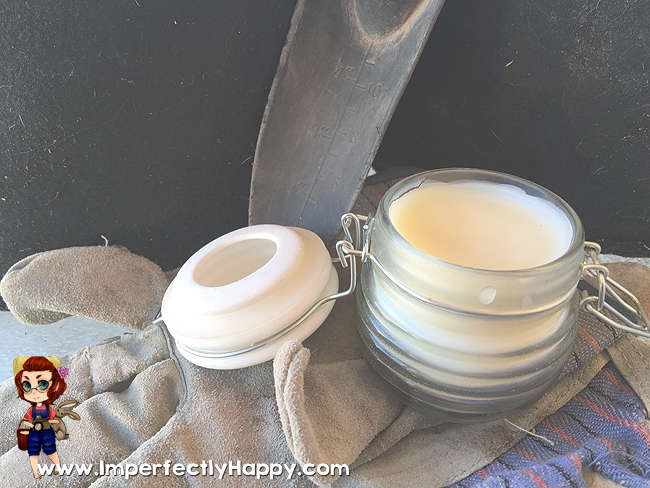 If you prefer the consistency of a salve vs a balm, you could lower the amount of beeswax in the recipe. Gardeners hand balm soothes dryness, heals cracks and generally helps my tired hand (and flaky elbows). If you garden or work outside you know how hard the dirt, sun, sweat, etc can be on your hands. This is a great balm to put on after you get inside. But you’ll find it hard to keep everyone out of the jar because it just feels so good on the skin. The gardeners hand balm isn’t just for HANDS – elbows, knees, heels; anything that needs a little extra hydration and healing. It can also be good for those with eczema. These little jars are great for gifts too – just wrap some raffia or a pretty ribbon around it. I have even made these in smaller baby food jars as giveaways at our garden exchange. Easy Peasy! ~Firms the balm and adds a layer of protection to the skin when applied. ~Known to clean and soothe cuts. burns and other skin irritations. The scent is also calming to the mind and body. Double boiler or a substitute – I do not recommend microwaving these ingredients. Your Gardeners Hand Balm is now ready to use. Keep some for yourself and share as gifts. FYI, I often keep a jar in the fridge because I find it extra soothing in the summer heat. I make a very similar one, but I use olive oil that I have infused with Calendula. Calendula has healing & soothing properties, great for cuts/scratches and minor burns. With that, the Lavender and the Chamomile EO, regular use is the only thing stopping my hands from looking so bad I feel the need to hide them. Love the scent of lavender. However, I am horribly allergic to it! I get contact dermatitis or hives every time it touches my skin. The same thing happens with frankincense, some lemon preparations, and today I learned, also with some peach, apple, and jasmine products. What do you recommend to add a nice scent and avoid the itchy-burnies? I would probably go unscented.